Buying a home is one of the most amazing things you can do in your life, on the flip side it can be stressful if you don’t know the process. To help make things easy for you, I’ve put together a list of 6 must do’s before buying a home in Altadore, Calgary, Alberta. It’s well worth your time to build a relationship with me as your Altadore REALTOR®. I will advocate for your needs and find a home that suits you and works in your best interests. I'm able to help you interpret the Altadore MLS® listings data and share the local knowledge of the market to you. If you try to do things alone, you run the risk of compromising one of your most expensive investments you will make in your life. You will want to ensure that you have good creidt in order to qualify for a mortgage. It is important to not have too many credit inquiries when you are looking to find a mortgage provider. It is better to do your reasearch without credit pulls - and definately don't go buying that new car or obtaining new credit cards right before you intend to purchase your home. It's a disheartening feeling when you fall in love with a home that you don't qualify for in Altadore. To find a home that is financially comfortable for you, your home payment should not exceed 30% of your monthly income. View the Calgary Mortgage Calculator for an estimate of how much you can afford. This way you can get an idea of your future Altadore home mortgage costs. Homes over the $1M a minimum 20% downpayment is required. In addition to your downpayment you will have other closing costs - a lawyer will have to register your mortgage on your title and your title will have to be registered to you. Closing costs range dependent on your purchase price from $1000-$2500 roughtly but these costs should be confirmed with your lawyer. When making an offer, a pre-approval letter from a reputable lender is a powerful tool in your Altadore home buying arsenal. It does not require all the documentation that a full loan application requires, but it will get you started on the right track. You may not be home all the time, but most likely you will be living in your Altadore home for a couple of years minimum. Take time to really assess what your needs are, what you’d like to have and what you won’t do without in finding the house you love. 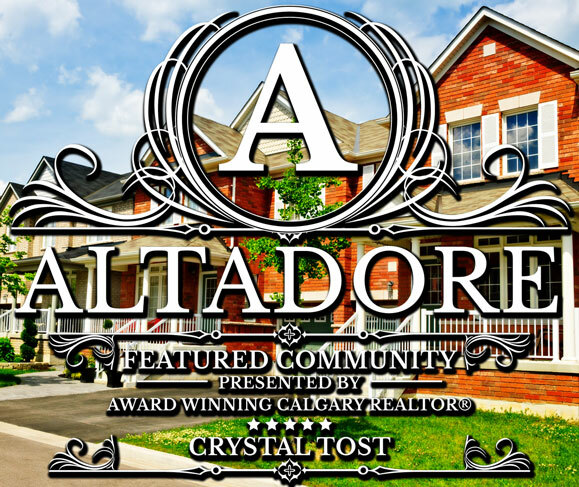 Altadore is a community engulfed with modern luxury homes and is rated one of the best communities to live in Calgary. It's not hard to see why as Altadore is close to the beautiful and awe-inspiring River Park which is nearby the elegant Elbow River. Altadore is also close to the very popular and lively Marda Loop which is loaded with events, restaurants, food and shopping. View Altadore homes for sale along with in-depth information on Altadore, Calgary and its real estate market. Calgarylistings.com offers you the always up-to-date Calgary MLS ® listings with tools to easily find Calgary homes for sale. By displaying detailed information on thousands of Calgary homes for sale, we are the ultimate resource for your home search needs. We display home prices for Calgary, its communities/neighborhoods and surrounding areas. There are many homes for sale in Calgary, including condos, townhomes, and luxury listings. Calgarylistings.com makes it easy to find your dream home by filtering home types, prices, days on market, bedroom and bathroom amounts and more. That's not all, there are additional features of each listing such as displaying detailed property information like schools and amenities along with plenty of photos and video tours. Great post. I agree on each of your points. Don't buy a house just because the market is down now and it is a good time to buy. Take time to make sure you make the right decision. And don't buy a house if you do not see yourself living in it 5 years from now. The emotions involved in buying a house are some of the strongest one can encounter next to love or grief. Buy a home in Altadore because you've run the numbers for your particular situation and you've found that it's the best choice financially for your current situation. The only house I'd be willing to buy in Altadore would have so many conditions attached I doubt I'll ever find it. Excellent guide on buying homes in Altadore. I agree with your 6 do's and a Altadore REALTOR® is the safest bet. Based on your credentials and article, your highly qualified for the job. I bought a house I could afford in Altadore by following 'How Much Home You Can Afford.' I love my modern house, and it has served us very well. People often overlook closing costs, great idea to point that out in your article. Here is a tip, think if you can live in the house until the day you die, if you have to think about it long, its not the house for you! Your home is your safe haven from the outside world. If your scared you cannot afford the mortgage you will lose that safe haven feeling and up a ball of stress. Before we bought our house, we looked at countless listings, pre-screened many houses, and went into 10-20 houses all over Calgary and finally settled on a Bungalow in Altadore. Sounds like great common sense advice. I would also add visit a house in Altadore at all hours of the day. Open House is not a good representation overall. I can't wait until I'm in position to purchase my first home in Altadore. I believe that sometimes you just need to dive in and just have faith that things will work out. Although it can be risky to stretch yourself too thin for a house, especially when you have a family. Go there at 6 am, 12 noon, 6 pm, 12 midnight. See how the noise is, rich people like to party too! Saving for a good down payment and then saving extra money for a few mortgage payments ahead of time to be safe is the best advice I can give. I bought a house last fall in Altadore and despite my pretty exacting calculations of what i could afford, the ongoing costs are still more than expected. Found this post on Twitter, great read! Many people don't consider closing costs for homes in Altadore. These fee's eat a great amount into your equity. I recently looked into the costs for a loan of 280,000 that had closing costs in the neighborhood of 10,000. If you may not be in Altadore within 5 years you have to decide if the value of your home will increase enough to cover these costs. Check out amortization calculators to learn how much equity you will have put into the house over the course of 5 years. Love the Altadore real estate video, very flashy, These tips are sensible for home buyers wherever they may be, not just Altadore. These are great tips as most people don't think about all of them when considering a new home. Due to what's going on in Calgary, banks are tighter with their money. I recommend saving up to 20% of a down payment for a home in Altadore. This also will build financial discipline as it is not how much you make, it's how much you keep! Awesome tips for buying a home in Altadore! I especially like the ' Buy A House You Love'. In my case, I feel like it's 'time' to buy a house though I haven't found one I love just yet but I'm working on it! It's one thing to rush in and buy a house foolishly especially with Calgary's real estate market. Yes sales are down and some homeowners are desperate to sell so you can get great deals as a buyer, but I doubt that is happening in Altadore. Luxury costs.